Most times I write about a Boulder County food or drink business, I have to think up a good theme for the article. In this case, Decadent Saint has such a compelling story it sort of writes itself. Decadent Saint founder Michael Hasler is a New Zealander with 35 years of winemaking experience. While running a luxury ski lodge in New Zealand and before he moved to Boulder, Michael would serve his guests homemade glühwein, a German/Austrian traditional winter drink made from wine and spices and served warm. Michael’s glühwein contained chocolate, a rather unusual addition, and was so well received he thought for years about how to package it properly as a mixer for retail sale. However, almost all mixers on the market are pasteurized and filtered to create a long shelf life, which removed much of the goodness of the product. It wasn’t until he moved to Boulder and started his own winery that he came up with the perfect solution. By fortifying the drink to 20% alcohol, he was able to mix red wine, decaf coffee, chocolate, and berries to form a glühwein mixer that would stay shelf-stable for six months without requiring either filtering or pasteurization. He then expanded to create a similar mixer for sangria and voilà – Michael created one of the best, most delicious mixers available on the market. At a recent gathering of press to present his mixers, Michael served us tastes of half a dozen different drinks made from his four varieties of mixers: passion fruit, raspberry, black current, and spiced dark chocolate. While the second part of the name Decadent Saint plays off Michael and his wife and business partner Carolyn Coree’s Saint Bernard Chloe, the first part of the name is apt. The mixers and resulting drinks were delicious, one after the other, without fail. 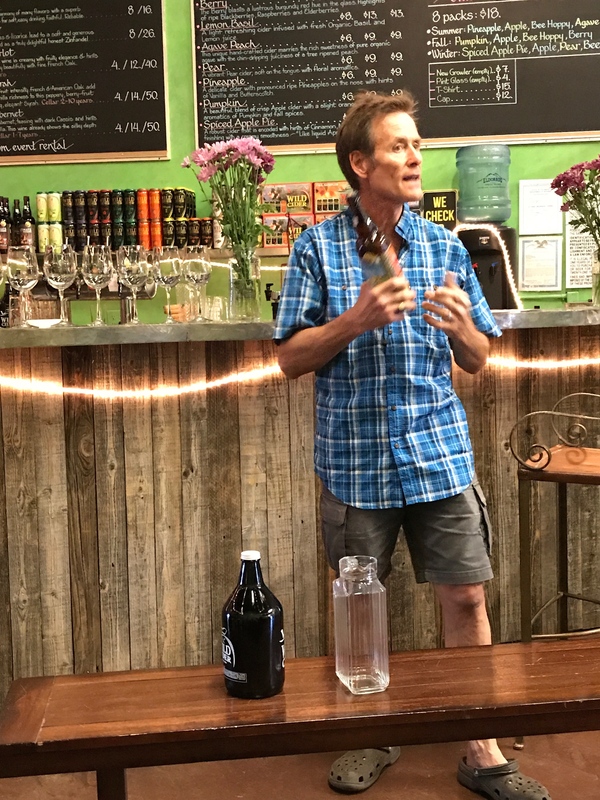 Michael is now selling directly to consumers via his tasting room and website; at retail in liquor stores; and to mixologists and other professionals in bars and restaurants. The business is booming, Michael is traveling the country explaining the mixers to consumers, and to procure unpasteurized product, Michael is having to go directly to berry farmers to ask them to set aside berries just for Decadent Saint. Each bottle has two labels, one on the front and one on the back. For example, the blackcurrant mixer is sold as both a Spiced Sangria and an Ultimate Mixer. From the consumer’s perspective, it is not clear how to use the product. Michael bills his product as the Swiss Army Knife of mixers and provides a handout showing 11 different mixed drinks, ranging from mimosas to margaritas to martinis, that can be made from just one mixer. Multiply that long list of options by the four mixers he produces and you have an amazing variety of drinks you can make, which also makes it amazingly complicated. The mixers are not cheap ($22 for a 750 ml bottle on the company website) and consumers might compare these high-quality, alcoholic mixers to the more standard and much cheaper versions on the market. The website itself has no real background on the company or the mixers. The company, Decadent Saint, is still a winery and the company website and tasting room promote both wines and mixers. My favorite use of the mixers is in a simplified fashion. I love the idea of pouring a small amount over ice cream or mixing just one mixer with a simple tonic water or inexpensive sparkling wine. I recently used the blackcurrant mixer to very effectively save an opened bottle of red wine that was going bad. For those of you living in or visiting Boulder County, I highly suggest you make a trip to the Decadent Saint tasting room at 1501 Lee Hill Road. Not only do they have an excellent happy hour but you can taste some of the high-quality wines (with grapes purchased from California), sample the mixed drinks, and learn the story directly from Michael or Carolee if you are lucky. Interesting stuff! I tend to agree from a business/marketing perspective, that is a heck of a challenge, but I’m also really excited to try these elixirs! Great, interesting read, thanks!